NEWPORT BEACH — Along Mariner’s Mile — Newport Beach’s commercial corridor along West Coast Highway — boaters could easily spot the 148-foot charter boat Majestic jutting out into the bay, conspicuously farther than its surrounding vessels. And it was enough to get the attention of city officials. “It’s not 1 or 2 feet over — it’s egregious,” said Harbor Resources manager Chris Miller, in reference to Majestic’s violation of a city ordinance in place to keep vessels from protruding or “overhanging” too far past dock fingers and into navigable waterways. Majestic, often chartered for weddings, parties and high school dances, was sent packing, leaving Newport Harbor Jan. 25. 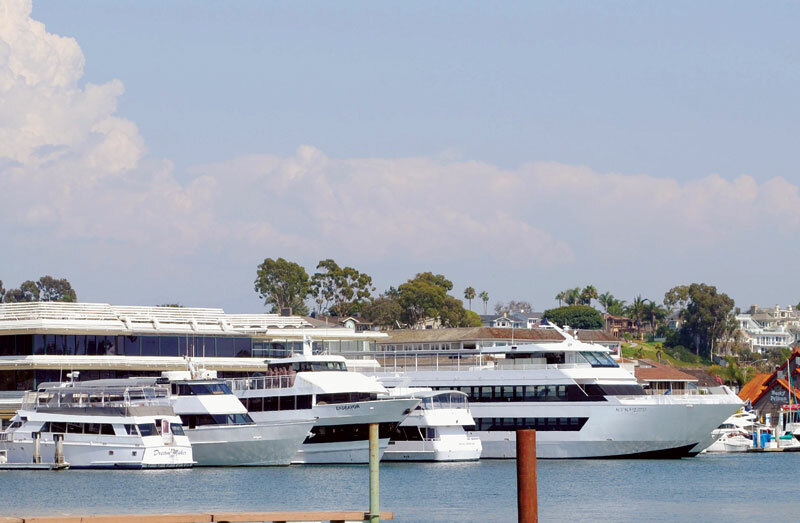 Since October 2011, the city has handed out more than $8,000 in fines to Majestic operator Pacific Avalon Yacht Charters and $7,800 to dock owner Water Front Newport Beach for the overhang infractions. According to the ordinance, boats are allowed to extend past the pierhead line (or end of the dock fingers) out into the water by one beam-width. Water Front Newport Beach’s 73-foot docks at 2901 West Coast Highway left Majestic — which has a 31-foot beam — extended about 20 feet past its allowable mark. According to Miller, the 400-passenger vessel had overstayed its welcome in the harbor, which had been limited to temporary docking status at Water Front Newport Beach, but over the past year, had become permanent. “He was only allowed to come in temporarily from Long Beach, for a day here, or two days there, but that changed,” Miller said. Miller sent Pacific Avalon Yacht Charters president John Gueola a letter stating that if the vessel was not moved, administrative actions, civil actions or actions by the Orange County Sheriff’s Harbor Patrol could be taken. Gueola had the boat moved to Long Beach Harbor Jan. 25, and both Pacific Avalon and Water Front Newport Beach paid the fines in full. “I can’t deny the boat was overhanging, but unfortunately my back was really against the wall,” Gueola said, adding that plans to have the vessel docked at the Bellport shipyard and marina at nearby Rhine Channel fell through, leaving Gueola with few options for the boat. Gueola said spots capable of docking the vessel opened up in Long Beach as charter boats headed south for the winter, but the location is not ideal. “Financially, it’s really harsh just taking the boat back and forth from Long Beach to Newport,” Gueola said. The boat’s issues in Newport Harbor have been ongoing for years, but came to a head December 2011 when a new Marine Activities Permit was to be established for Pacific Avalon, and the permit language included references to Majestic berthing at the docks. The permit was rejected by Miller. “I had been giving him citations for his boat because it doesn’t fit in the slip; how could I consider an application that says Majestic is part of your business plan?” Miller explained. Pacific Avalon operates two other vessels at Water Front Newport Beach: the 94-foot Royal Princess and the 126-foot Ambassador. All three vessels were docked in front of the Water Front Newport Beach building, which controls the parking for the charter companies operating at their docks. As the largest charter boat in the harbor, Majestic had been a point of contention over the past year, following the California Coastal Commission and Newport Beach City Council approvals in December 2010 and January 2011 of a new slanted dock configuration at Water Front that would allow for all three Pacific Avalon charter boats to be permanently berthed at the site without breaking the overhang rule. At a city council study session last year, Newport Beach Harbor Commissioner Ralph Rodheim recommended against the project, stating there were possible hazards and aesthetics issues related to slanting or canting docks in the harbor to make room for large boats. “As time has passed by, boats are getting bigger — both private and charter — and the docking area should be a little more sensitive to the needs of the boat owners,” Gueola said. Water Front Newport Beach is working on getting final approval from the Army Corps of Engineers and the Newport Beach Building Department for the new docks, meaning the $1 million project could be out to bid by spring. Construction would start with the demolition of the existing 2,950-square-foot dock system — consisting of six slips and 23 pilings. It would be replaced with a new 4,325-square-foot commercial vessel dock system in a different configuration. The new dock system allows for four vessels to be berthed at the site, including Majestic, Ambassador, Royal Princess and the 40-foot Spirit of Newport. Once the docks are constructed, Miller said he would accept an application from Pacific Avalon for a new Marine Activities Permit with Majestic in the plans. In addition, the two sides have agreed to allow Majestic back into the harbor to fulfill the two charters already booked for Newport Harbor over the next two months.